We hope your newly arrived flower arrangement brings you all the joy and beauty that Flowers so eloquently deliver. 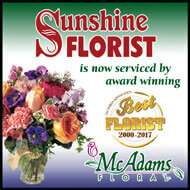 Most floral arrangements last a few days or longer, depending on the types of flowers And the care they receive. A little extra care from you can make a big difference. Here are our expert tips for longer-lasting, more vibrant flowers. Upon arrival, check water level and add warm water if needed. Keep water level high in vase. Floral foam should be kept saturated. Continue checking water level every day. If needed, add warm water, properly mixed with floral food. Carefully follow directions on the package of floral food. 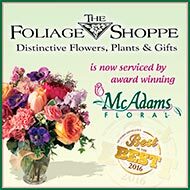 Display flowers in a cool location (65F-72F preferably) away from direct sunlight. Avoid excessively hot or cold areas, such as atop radiators and televisions or next to windows. Protect from drafts caused by ceiling fans, heating/cooling vents etc. Protect your furniture. Place protective material under flower display to avoid damage from moisture. It is preferable to add water over a sink when necessary. Keep flowers out of reach of small children and pets. For maximum longevity, you may wish to change the water if your bouquet is in a vase. To maintain the structure of the arrangement, tie twine, ribbon etc. around the stems just above the rim of the vase. If possible place the flowers in another container filled with water. Wash the vase with soap and water and rinse thoroughly. Refill the vase with clean warm water. Rinse your bouquet stems under running water and recut each stem diagonally. Diagonal cuts prevent blowers from sitting flat on the bottom of the vase and blocking water absorption. Trim about ¾” from each stem. It is best to use garden pruners or a knife. Scissors are not recommended. Place your bouquet into the vase of fresh water. Make sure there are no leaves or stem pieces floating in the water or submerged below it. This debris and promote the growth of bacteria, which shortens a flower’s life. Some flower varieties bloom quickly, others slowly. Prune off old blossoms as this encourages fresh blooms to open.